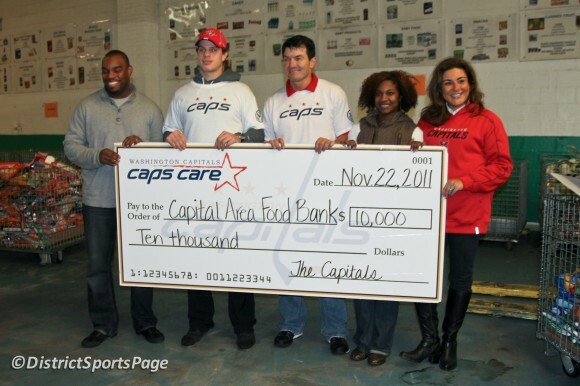 Washington Capitals Fans – Want you to help us make a difference in the community? Join Capitals alum Peter Bondra, mascot Slapshot and Red Rockers, along with Comcast SportsNet play-by-play announcer Joe Beninati and anchor/reporter Jill Sorenson and Mix 107.3’s Chilli Amar at the Capital Area Food Bank on Tuesday, Nov. 20. Volunteers are needed from 1-4 p.m. to help pack and sort donated food at the Capital Area Food Bank’s food distribution center. Show the community that you care, chat hockey with fellow fans and give back with the Caps. Space is limited so sign up soon! The Washington Capitals will hold auditions for their 2012-13 Red Rockers spirit squad on June 24-25 at Verizon Center. The Red Rockers are a high-energy spirit squad that assists in giveaways, promotions and in-game activities at Washington Capitals games. The squad works with the game entertainment staff to ensure that all Caps fans have the ultimate game experience and the squad’s members are ambassadors for the Capitals organization. Auditions will begin on Sunday, June 24, at 11 a.m. with registration open at 10 a.m. at the administrative entrance of Verizon Center. Day 2 of the audition process will take place on Monday, June 25, at 5 p.m. Auditions will involve fitness tests, so participants are asked to dress appropriately for physical activity. Participants must be at least 18 years of age, a high school graduate, able to commit to a minimum of 25 regular-season Capitals home games, physically fit and outgoing, energetic and comfortable performing in front of crowds. Interested individuals should contact the Washington Capitals to participate in auditions by emailing redrockers@washcaps.com for registration information.